Washington's claim of Reuben Foster when no other NFL team would touch him seemed bad enough. Thursday, Doug Williams made the entire ordeal that much worse. 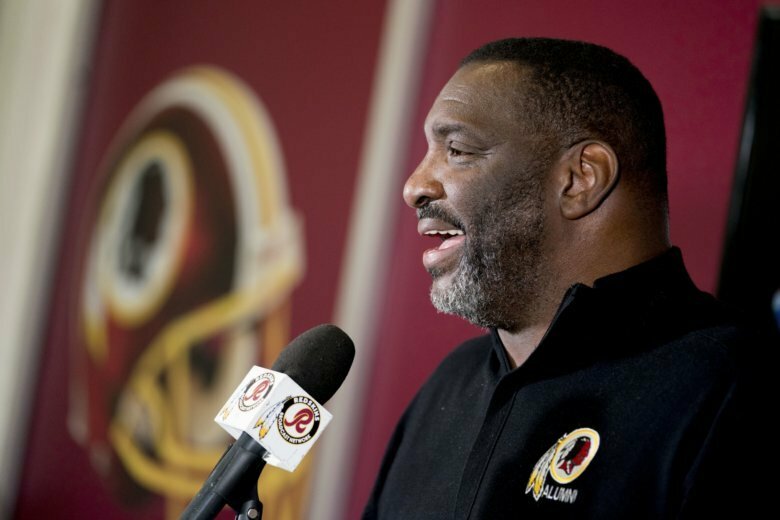 WASHINGTON — Doug Williams has full-on NFL brain. I don’t mean this in regards to anything having to do with any physical or psychological fallout from his having played football. I mean it in the way that Roger Goodell has full-on NFL brain, how the disease of his fealty to capital “F” Football above any of the many more important aspects of our society has seemingly spread and infected the higher ups at the teams around the league. Now the Senior Vice President of Player Personnel for the team that he once quarterbacked to a Super Bowl win, Williams was the one whose name was attached to Washington’s release that acknowledged the team’s claim on Reuben Foster, the linebacker released by the San Francisco 49ers earlier this week after repeated accusations of domestic violence. While we’re used to seeing teams give second (and third, and beyond) chances to players accused and even convicted of crimes, no other team put in a waiver claim on Foster. Washington was the only team to put in a waiver claim for former 49ers’ LB Reuben Foster, who was arrested Saturday night on a domestic violence charge, per source. No other NFL team put in a waiver claim on Foster. So why did Washington? Williams went on the radio Thursday to defend the decision Thursday and somehow managed to make himself and the organization look worse at basically every conceivable turn of the conversation. His appearance included every possible trope of someone who wants to make it sound like he understands — but very clearly does not understand — the ramifications of his decision. It included the classic “father of daughters” qualification (“I’ve got six daughters, so it ain’t something I would condone”). Williams also engaged in a token bit of whataboutism, as he didn’t-bring-up-but-actually-did-bring-up the fact that other teams had also employed players with checkered pasts. When questioned about whether the team — which didn’t check in with the local authorities, something even the Eagles did — had performed its due diligence, Williams leaned on the fact that team officials spoke with former Alabama players under their employ. Except, well, they weren’t exactly thorough on even that very basic count. None of the five former Alabama players confirmed that management spoke to them. Two — Ha Ha Clinton-Dix and Jonathan Allen, who played for Alabama at the same time as Foster — said they weren’t asked. Ryan Anderson and Shaun Dion Hamilton declined to comment, while Daron Payne was not available in the locker room. “Well, you know, we didn’t hold a convention,” said Williams. Alright, then. Surely he understood the moral consequences of such a decision, though. “Basically what you’re doing here is you’re taking a high-risk chance,” said Williams, seemingly indicating the potential liability of bringing someone with Foster’s past into your organization and what that might mean for the other players, employees and anyone else who Foster might deal with. But that wasn’t what Williams meant. And there were few worse words he could have chosen in his expression of the true meaning of his statement. Yep. Not only does Williams see the public-relations disaster as the only negative in the situation, but he actually used the term “beat-up” to describe it. I wonder if there could be any recent indication that Williams’ judgment when it comes to off-field behavior might be impaired, that he might twist his interpretation of whatever happened to fit the needs of a football team. Right. But wait, there’s more, if you can believe it. It’s difficult to imagine who “people who are in high, high, high, high places” are if not for Donald Trump, who has been accused of sexual misconduct by at least 19 women. The choice to invoke Trump, or whoever else in power Williams was alluding to, is a bizarre enough deflection of responsibility for both Foster and the organization. But there is a particularly galling irony in that word choice — “small potatoes.” That is, as the football fans in the room can tell you, the term used by Trump himself when describing the USFL — the league his hubris torpedoed, in which Williams played and became a star prior to his Super Bowl with Washington — years after the fact. The act of claiming Foster, when nobody else would, showed that this organization isn’t interested in even pretending it has any semblance of a moral compass. But Williams’ radio hit revealed a far more damaged and amoral psyche, a judgment system devoid of any understanding of right and wrong beyond what might — someday, if Foster is eventually reinstated — lead to a better chance to win football games. Whatever moral failings may occur in other parts of society, Williams is in no position to lay blame at anyone else’s feet for his own ill-reasoned decisions. When it comes to football, he and his team are at the top of the power structure as members of the richest, most powerful sports league in America. If he believes it’s the responsibility of those in high places to set an example for everyone else, now might be a good time to take a long look in the mirror. UPDATE: At a news conference on Friday, Williams offered a vague apology for his remarks but did not take questions.